It may surprise you, but even small tweaks in your website copywriting can increase conversion rates by 30% and upwards. And with margins being as tight as they are, can you really afford to pass up any change — even minor — that could make a massive difference to your conversion rate? No, we didn’t think so! To help, we’ve compiled the top 4 actionable tips on how to super-charge your conversion rate with small copywriting tweaks. All (good) businesses provide a solution to a problem — we exist, after all, to meet a need. But don’t assume people come to your site to be told what their problem is and how you are going to solve it. Chances are, they’ve already done the research on their problem (and the solution) and are now looking to make a decision between you and your competitors. In fact, Corporate Executive Board surveyed 1,400 B2B customers in 2012 and discovered that over 60% of them had already ranked all available options, pricing comparisons, etc., before actually visiting your site. Spend less time talking about how you solve the problem and more time explaining the benefits of your product or service. In particular explain how your benefits are better than the competitors’. Adding pictures to your site can increase the length of time a customer stays on your page by as much as 21%. One great picture of a smiling, happy customer (preferably holding your product) can do more for your conversion rates than a page (or five) of text — no matter how great the text. Look at the example below. Highrise boosted their conversion rate by 102.5% simply by tweaking the copywriting on their landing page, replacing a text-heavy version with a picture-heavy one. You can do the same with a great video too. 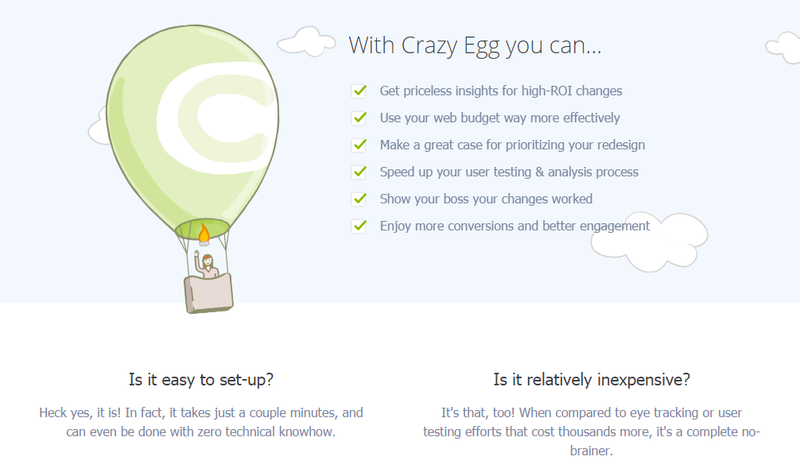 Crazy Egg increased their conversion rate by 64% when they uploaded an explainer video to their landing page. The video’s script didn’t say anything that wasn’t already in their marketing copy, but by changing the medium, they lifted conversion rates. The most important function of the marketing copy on your site has to be removing objections. As consumers, we all have objections to buying — something that stops us from taking action right then and there. Your job is to find out what those objections are (specific to your business) and remove them. If you’re not sure what the objections your customers might have, simply ask them! A good tip is to install a customer survey feature (for a limited period) like Qualaroo, as seen below, and ask them about the factors preventing them from hitting the “Buy” button on your site. When existing customers explained how the product works — in their own words — it was less technical and, therefore, more effective. Customers phrased things in a way that prospects understood, and that made heatmaps easier to understand. You can achieve the same result by asking for testimonials from your happy customers. 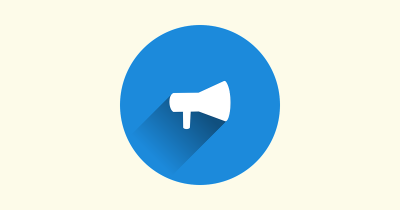 In particular, look for testimonials that address common objections. Crazy Egg compared the heat map to regular eye-tracking, proving that heatmaps provide immense value to the customer because they are quicker and more cost-efficient than eye-tracking. You can do the same by showing how your product compares to alternative solutions. Consider side-by-side comparisons or comparison charts. On a side note, comparison charts tend to attract a lot of traffic, which will help your SEO. Crazy Egg made it very clear at check-out that the credit card information was there only to protect against people signing up for multiple free trials and that the credit card would not be charged at all. 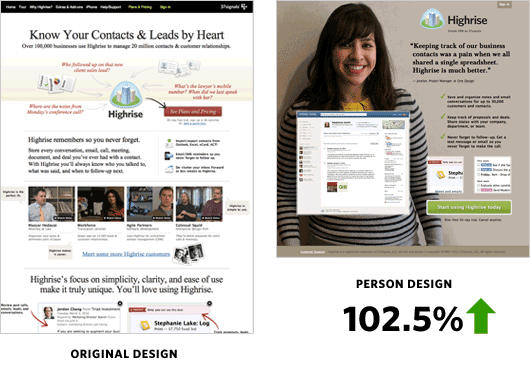 The changes to this copy on the check-out page increased conversion rates to 116%! Below is another example. Basecamp, addresses several common objections at once in this screenshot. Now look at the bullets to see how Basecamp answers these questions. Here, we aren’t talking about keeping your language clean (although you should)! Language is powerful, and one wrong word used in the wrong place can send your conversion rates into a tailspin. Don’t Remind Them That There’s a Cost! The moment when a customer decides to buy is not the right time to be super-aggressive or assertive with your language or calls to action. Remember that most people have a micro-second of self-doubt when they’re about to put down cold, hard cash — so you don’t want to frighten them. Recognize their hesitation while nudging them gently forward. 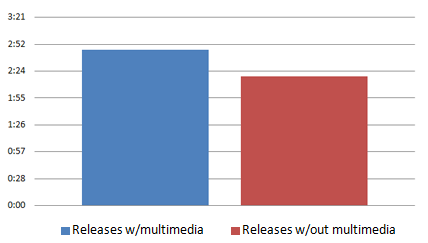 “Purchase Now” decreased conversion rates by 14.5%. “Buy Now” depressed conversions as well. Why? These CTAs remind people they’re spending money. “Add to Cart” sounds like less of a commitment. It also makes buyers feel they can back out later if they wish. 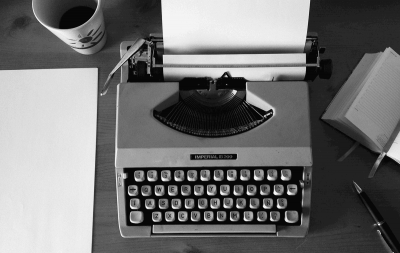 For years, direct-response marketers have known that long-form copy sells better. But there’s no such thing as bullet-proof best practice. Depending on your audience, too much marketing copy can decrease conversion rates by as much as 23%. Ask Square, who tested a version with a lot of marketing copy against one that used less copy. 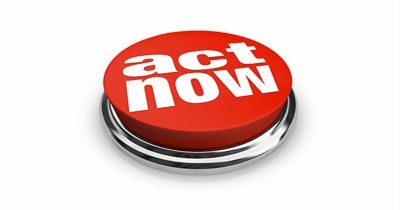 Their homepage now is a brief, benefit-driven headline with a “get” call to action. It has a few short sentences and icons deliberately designed to emphasize benefits and overcome buying objections. 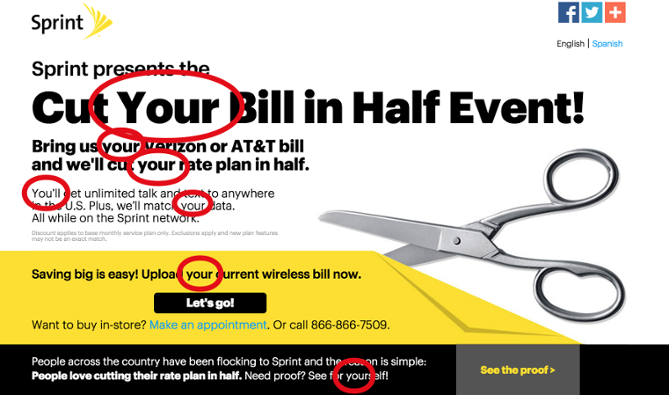 Think carefully about how and where you could use the word “You” or “Me” in your sales copy (always referring to the customer himself, not the company). Extensive testing of copy has shown that when websites use the word “You” or “Your,” the conversion rate goes up because the user receives the subliminal message that you are having an intense, one-on-one conversation with him. The words you use are more than a detail. They can make or break your conversion rates. Pay attention to the words you use — and how you use them — and it could translate into higher conversion rates and bottom-line profits. Don’t forget to conduct A/B testing on your copywriting tweaks to make sure that they work for you and your business! Have you noticed any other tweaks that make a big difference? Share in the comments. Mark Runyon is the founder and lead consultant at Atlanta-based Vandelay Web and SoundOut Social Media. Get in touch with Mark through LinkedIn!